When you hear the term “root canal,” does your mind start playing some tune from a horror movie? Well, we hope we can sort out the truth about root canals so you know they’re not that scary. In fact, the procedure causes no more pain than a filling. Root canal treatment is used to save teeth that would otherwise need to be removed. Due to trauma or decay, a tooth’s pulp (the inside tissue of a tooth) may become inflamed or infected. This causes pain and could cause an abscess. Root canal treatment is a way to clean out the affected pulp. Basically, the treatment involves making an opening through the crown of the tooth, removing the pulp, cleaning the root canal, filling the pump chamber and placing a gold or porcelain crown over the tooth. 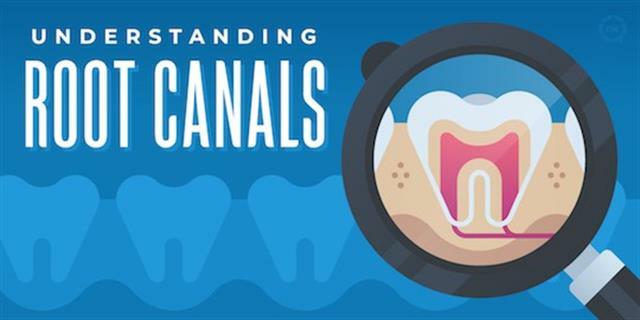 Why do root canals get a bad rap? The main reason people talk about the pain of a root canal isn't because of the procedure itself, but rather, the infection that necessitates the procedure. When a tooth's nerve tissue or pulp becomes infected or inflamed, it really hurts. Often a secondary infection in the form of an abscess can form at the base of the tooth as well, and when it fills with pus, it places a lot of pressure on the nerves in the area. Again, uncomfortable. The other reason root canals have acquired a bad rap is because of old technology. In the past, rotary drills required a lot of pressure to clean out the tooth. That pressure created heat, which in turn heated the nerve, causing pain. Also, just the sound of the drill itself created a certain sense of mental anguish among patients that furthered the concept of pain even in its absence. Today, improved drill technology, and the wide array of anesthesia available, mean that the procedure is no more painful or uncomfortable than a regular filling. What are the risk factors for needing a root canal? Tooth decay should never be ignored. If you’ve been diagnosed with a cavity but have not yet scheduled your filling, decay can increase to the point of needing a root canal. Multiple dental procedures on the same tooth. Smokers are twice as likely to need root canal treatment. Tooth trauma. Have you been hit in the mouth with a hockey puck? Even if you don’t see a chip or crack, your tooth could be affected. If at any point your dentist suggests root canal treatment, don’t be afraid! A root canal is a simple procedure that helps restore your natural tooth instead of having to replace the tooth with an implant. Modern dental technology removes all the fear surrounding root canal treatment. You’ll be fine!